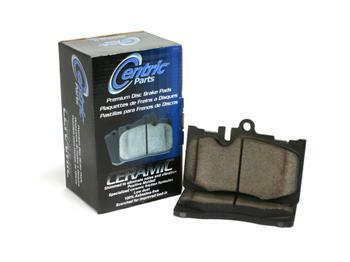 Centric Brake Pads - Premium Ceramic - Dezod Motorsports Inc - Home of the automotive performance enthusiast since 2002. Centric Parts Premium Brake Pads provide superior stopping power and reliability for passenger cars and light duty trucks. Centric Parts’ engineers have worked with leading brake pad manufacturers to develop two application specific friction compounds that combine improved braking performance and reduced noise under braking. All Centric Premium Brake Pads are installation ready with shims installed to prevent noise associated with pad vibration. Centric Premium Brake Pads also feature O.E. style gas slots and chamfers to optimize braking performance in repeat stop situations. All Centric Premium Brake Pad formulas are 100% asbestos free and have O.E. style wear sensors installed. Centric Premium Metallic Brake Pads are formulated for increased service life while maintaining high friction levels at all operating temperatures. Centric Premium Ceramic Brake Pads are manufactured using Positive Mold technology that provides even wear characteristics throughout the lifetime of the brake pad. Centric Premium Ceramic Brake Pads are scorched to remove impurities in the friction material and improve initial pad/rotor bed-in. Ceramic friction formulas provide excellent stopping power hot or cold. Longer pad life than other friction materials. Low dust formulations keep wheels cleaner.